Celebrating its 15th anniversary with women, nature and the occasional anamorphic fusion of the two. I’m standing under a spherical concoction of wood and found objects, while something is dinging constantly nearby. I can see a clock face, partial vinyl record, miniaturised wine bottle and at least a dozen broken dolls above me. In a way, this suspended installation by Lesley Hilling acts as a metaphor for the Affordable Art Fair (AAF); an assortment of oddities, unconventional quirks and the usual suspects all rolled into one. And just like half of what is buried in Hilling’s ‘The Cluster’, some of these artworks are hard to identify- like whatever has been dinging all this time. Kinetica Museum leads the project space with Hungarian-born UK artist Balint Bolygo’s ‘Trace 2′; a motorised drawing machine that sketches a plaster cast of Bolygo’s head onto a rotating cylinder wrapped with paper. It transforms a self portrait into a performance art piece of its own. Rainbows of colour draw you into this space with a range of visual mixed media pieces, including ‘Feminine Principle’ by Mike Booth that resembles the motions of a kaleidoscope. Throughout almost any contemporary art show of this size, you can expect to find geometric shapes, bursting colours and materials that dazzle when you look at them. Zac Greening’s ‘Profile of a Sunrise’ ticks all the boxes. Using strategically portioned and positioned red, pink, orange and yellow Mylar cutouts, Greening cases this installation in double glazed glass, which hangs from the ceiling and encourages everyone to get their prints on it. It is a massive pinwheel that catches light even in this dim room. As I make my way under the fuchsia lit, black canopied celling, the DJ drowns the high- pitched dinging out. As thankful as I am for this, I still wonder where it was coming from. In light of International Women’s Day on 8 March 2014, women are at centre stage this spring with wire mesh-sculpted female figures by Nikki Taylor and Lyndsey Keeling, girls drenched in Lora Zombie’s grunge-meets-Banksy style and feather-haired ladies painted by long time AAF native Amy Judd. And while it might be easy to almost bypass Rachel Ducker‘s dancer sculptures -as they are quite small- once you spot them, your eyes are glued to their ornately wired plaster bodies. Nearby, Madrid-based artist Eva Santín -who also displayed at AAF Hamburg last winter– presents something of an overlooked beauty with her ‘Ophelia’ collection of a woman sinking and floating in bodies of water. Her choice of media, woodcut on digital printing with pigment ink, reveals natural groves from the wood, creating an impression that complements the water theme whilst supplying an unmatchable texture. The effect is deceptively similar to water ripples. But amidst these gems are the pieces that will surprise you, and not in the way Jeff Koons’ giant balloon dogs might, because after all, this show is more about selling than shocking. Still, there are refreshing doses of sarcasm, like townscape artist Richard Burel‘s mixed media portrayal of an unlikely superhero taking a photo of himself, titled ‘Doing a Selfie’. His style may be a bit busy, with colours, textures and techniques all over the place, but it does send the message: even superheroes can suffer from digitally- powered 21st century vanity. 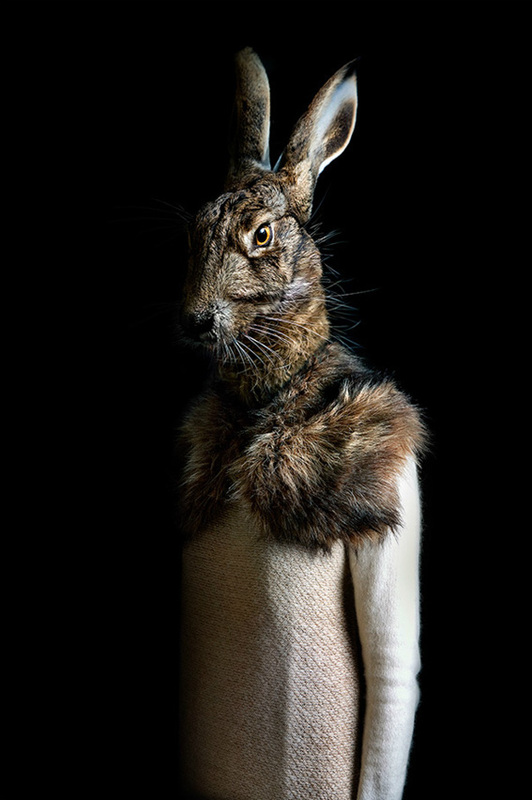 Miguel Vallinas Prieto’s ‘Rabbit – Portrait Number Twenty Nine’. Photo courtesy AAF 2014. But nothing delivers irony like having animals at the forefront of portraiture, in a setting characteristic of Renaissance oil paintings, by Daniel Sueiras. He makes a meerkat look like Mona Lisa. Wings remain a favourite in the AAF. Hazel Mountford‘s refreshing assemblage of acrylic paintings on strategically angled gesso boards amalgamate into a nature scene filled with birds and bees. Just a few booths down are Karenina Fabrizzi‘s surrealist oil and ink canvas paintings that reveal women with animal heads. While, it might be easy to make a half human/half bird appear as a natural being through brushstrokes, the same cannot be said for Miguel Vallinas Prieto’s Lambda prints. Keeping with the ‘animal in us all’ concept, Prieto uses taxidermied specimens mounted onto contemporarily dressed people to give his ‘Second Skins’ photography series an alternate realism. It is the boldest statement of the night. But it does however, make me question; how big is that rabbit? And perhaps the most fitting way to cap the night off is with tales of the city itself. Nothing starts a conversation like Tobias Till‘s medieval-stylised ‘Oranges and Lemon’ narrated map of London, which bears an honourable resemblance to Macdonald Gill’s ‘Wonderground’ map that brightened London’s underground train stations 100 years ago. It highlights the city’s landmarks with typically dry British humour. Brilliant. But Martin Grover‘s life-sized Transport for London bus stop replica appears to be the most bittersweet testament to city life, with its fictitiously named buses that promise ‘wanderlust’ and ‘perfect days’ at the front whilst the likes of destinations ‘doomsday’ and ‘hearts of stone’ are tossed to the back. It is a modern tale of two cities, or rather, a tale of one city that caters to the hopeless romantics just as much as it does to the cynics. And on that note, my love/hate relationship with that dinging has begun again. As I return to the project space, there it is, tucked in the corner of Kinetica’s booth, the source of the dinging: an ever-turning bicycle wheel into which, Alexander Berchert has incorporated xylophone plates and plastic beads. It is almost as much of a melodic instrument as it is a performance installation. Now this is the perfect way to end the night.